HPANWO: Nikola Tesla- as Close as it Gets! 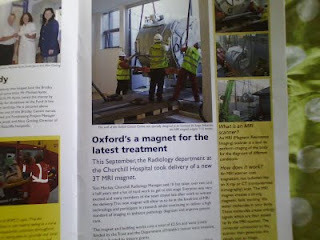 The other day I was browsing through the ORH News, my hospital's newspaper when I came across an article about the refurbishment of the Churchill Hospital’s MRI Centre. The centre was having a new magnet put in its MRI scanner. Magnetic Resonance Imaging is a fairly recent invention compared to X-ray; the first one was only installed at my hospital about 20 years ago. It can take pictures of the inside of the body in a similar way to X-rays only it shows up far more detail, especially of the soft tissues that X-ray pictures tend white out. MRI also doesn’t carry the risks from potentially dangerous exposure to ionizing radiation that X-ray does. The MRI magnets are some of the most powerful in the world; in fact when working in the MRI chamber we have to remove everything metal from our persons and if you have a cardiac pacemaker it can put you in danger. If you stand at the far end of my hospital, almost half a mile away, with a magnetic compass, the needle will move when the MRI scanner is operating. This extremely intense magnetic field when concentrated on a narrow cross-section of the body will cause the very nuclei in the atoms of our body to spin. The spin makes them give off their own magnetic signal which is strong enough to be picked up by the scanner’s detectors and converted into a graphic. It might make you feel dizzy to think of the very atoms of your body spinning, but in fact the patient should feel nothing at all, apart from a bit of claustrophobia from being inside the machine’s tunnel. MRI scanners are expensive; each one will set you back about £5 million, but many hospitals consider that money well spent. 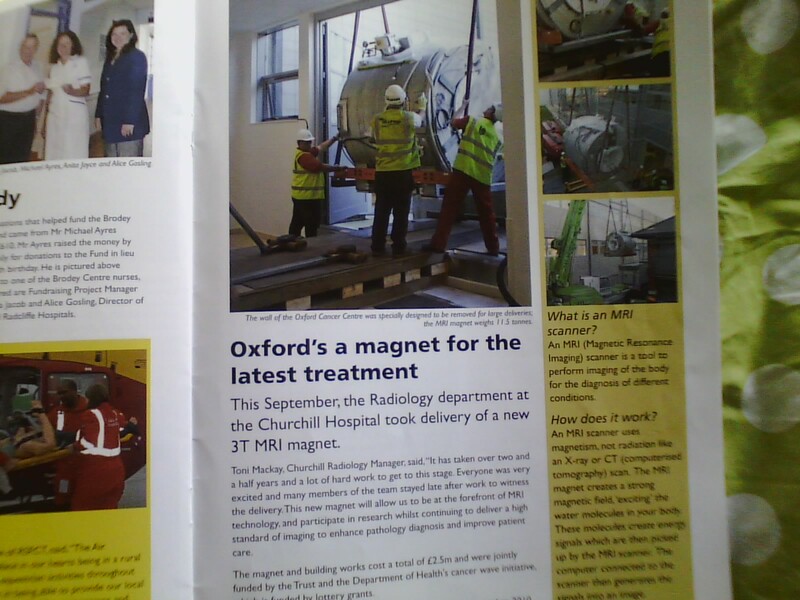 As you can see the article describes the magnet as “3T”; how many of the ORH News’ readers know what this means? Well, the T stands for “tesla” which is the standard unit of magnetic inductance, in laymen’s terms: how strong the magnet is. The world record is currently 5T and clinical MRI scanners vary from 3 to 4.5T. A fridge magnet will only be couple of mT, militeslas. The unit is named after one of the most remarkable men in scientific history, and possibly its most underrated; its greatest unsung hero: Nikola Tesla. You’ll hear a lot about Tesla in the Conspiracy-Paranormal research community but in the mainstream scientific milieu he is all but forgotten. He was possibly the man for whom the term “mad scientist” was coined. He was born in 1856 in Serbia and became one of the pioneers of the Electric Revolution, developing technology that eventually led to the workings of your computer monitor that allows you to read these words. He devised alternating current which is used today in mains electrical supply the world over. AC is also the principle behind the electric motor, a device so fundamental that it is essential to almost every aspect of modern society. His career began in 1864 when he moved to the United States to work for Thomas Edison, but he fell out with Edison over a payment deal and quit the company to go into business himself. His own company quickly became a rival to Edison’s in an almost TV miniseries-like revenge ploy. He had already had the idea for AC-alternating mains current, but the prevailing view at that time was that DC-direct mains current, the same as that produced by modern batteries, was the right path to progress. Tesla would eventually be vindicated, but not until after a long struggle. This struggle was bitter and sometimes turned nasty. Edison carried out a public demonstration that would be unacceptable and an obscenity by modern standards: He electrocuted an elephant, see: (WARNING! Upsetting content!) http://www.youtube.com/watch?v=Gr6xBz-h99U It makes me glad I live in the modern world and I feel somewhat scornful of the lament that today’s world is so cruel compared to “the Good Old Days”!) The world of mainstream science does halfheartedly applaud Nikola Tesla for his achievement with AC, but there’s a line in the sand between them for everything he did next. In 1899 Tesla travelled to Colorado and walked to the top of a mountain to set up an experiment involving a copper rod several hundred feet long erected vertically into the sky. The papers relating to this experiment are classified by the US Government and remain so today after 112 years! However the basic conclusion was recorded, that the rod became electrically charged, enough to produce a detectable current. The source of this charge was atmospheric electricity, the huge untapped reservoir of voltage above our heads that violently breaks loose during thunderstorms. Tesla was struck by the way electricity can travel through empty space without wires. It was accepted back then that electricity can be transmitted through the air in small amounts, after all this is the basis of wireless radio; but Tesla believed that this could be done with working electric currents with the power to drive motors and run donestic and industrial appliances. He decided to experiment and demonstrate it. Luckily no elephants were harmed this time and Tesla managed to put up wireless streetlights in Chicago. You can bet by now the existing interest he was attracting from the Government Intelligence services redoubled, and it was to double again many times. 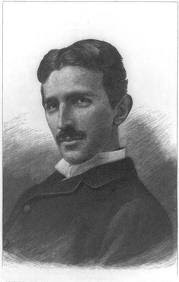 He built a structure at Wardenclyffe-on-Sound, New York that was to become the very icon of Tesla and his genius. 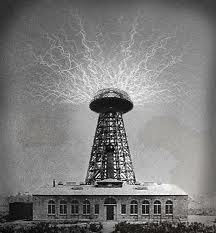 It was a huge conical tower with a dome-shaped electrical transmitter on the top of it that Tesla hoped would demonstrate his effect. Unfortunately its operation was aborted because its investors pulled out. Tesla had funded the project by making a deal with JP Morgan and the Astor Empire, not a very wise thing to do. It is something that happens again and again with any scientific discovery that is deemed “socially and economically unsettling”. America has a great tradition in backyard inventors, part-time amateurs who create marvels on a shoestring budget in their garden sheds, like the Wright Brothers. What can happen is that a rich financier from the world of Big Business often approaches these people and offers a “partnership” that involves the inventor selling the rights. These inventors are usually very short of money and eagerly snap it up. Sometimes these takeovers can be completely innocent with the investor being genuinely interested and truly keen to develop it, but sometimes it can be the first step towards suppression and secrecy. As soon as the contracts are signed the “business partner” takes all the papers and prototypes with the promise to “leave it all in my capable hands. This is going to be a great success!” and that’s the last the world ever hears of it. I urge all inventors to be wary. In the case of Nikola Tesla he wasn’t wary enough. As soon as Morgan and Astor realized the implications of his discovery they pulled the plug, literally and metaphorically. You see Tesla’s ideas were getting dangerously close to verging on the territory of the dreaded F-word, Free Energy. I’ve made a film about this subject here: http://hpanwo-tv.blogspot.com/2009/09/freikraft.html . His theories were about far more than just the mere transmission of electrical power, they concerned its availability. His belief was that electrical energy was present in the very body of planet Earth and could be extracted and used by anybody anywhere; safely, easily, in virtually unlimited quantities and without effort: Free Energy. This was bad news for the Illuminati rulers of the planet who don’t want us to have access to any energy source that they can’t stick a meter on and which can’t be rationed and doled out by their own institutions. This is for reasons I detail in my film Friekraft in the above link. Tesla was extremely eccentric and had an obsessive personality. He used to hallucinate and suffer nightmares, but his visions often aided him in his scientific ventures, like many other scientists. He was paranoid about cleanliness and refused even to shake hands with other people. He remained celibate his whole life through his own choice. As well as a scientist he was a student of oriental mysticism and was enthralled by the Hindu faith. Unlike many modern scientific media stars, Tesla did not see this as a contradiction. He spent the last few years of his life living in a New York hotel room and died in January 1943. The day he died the FBI ordered his room sealed off and all his papers were plundered and impounded by the US Government. They used the Alien Property Act to keep the papers under lock and key even though Tesla had been granted American citizenship when he was just 35 in 1891, more than 50 years before! To this day Tesla’s discoveries remain hidden from public access, although I suspect that they have been developed in secret. HAARP is probably based on a lot of what Tesla learned about the Earth’s atmosphere (see: http://www.youtube.com/watch?v=uZOt29NR0FY) and directed energy weapons could have been used to demolish the World Trade Centre twin towers on 9/11, see: http://www.youtube.com/watch?v=1_4NrRioRPU . The governments have accessed this information from sources other than Tesla's oeuvre. Other scientists have contributed and they've also salvaged the technology from the wreckage of crashed flying saucers, see: http://hpanwo.blogspot.com/2008/03/roswells-galore.html . Like most scientific inventions, Tesla's are morally neutral and have the power to be destructive as much as they have to be creative. They can therefore be used for either good or bad depending on who gets their hands on them. As I said above, Tesla is largely ignored by the history of science when in truth his name deserves to be right up there with the greats like Isaac Newton and Michael Faraday, not to mention his more renowned arch-rival, Thomas Edison. It struck me with a force of great revelation that just one single letter printed in the ORH News contained more of interest and had more of a stroy to tell than the rest of the issue put together. I asked one of the radiographers, a man with a qualification in the subject, about what this meant, just to find out how much he knew. Although he knew that the T stood for tesla he didn’t know anything about the man after whom this unit of measurement was named. This is one day going to change. Nikola Tesla will be vindicated and will take his rightful place in history when the people of the world finally take possession of his legacy. This legacy will transform the world in a way no other has; ending poverty, environmental destruction and imprisonment for the indefinite future. this side of the story. I was surprised that you aren't more popular given that you most certainly have the gift. Hey would you mind letting me know which web host you're working with? I've loaded your blog in 3 different web browsers and I must say this blog loads a lot faster then most. It's very easy to find out any topic on web as compared to textbooks, as I found this paragraph at this site. Hi, I check your blog like every week. Your humoristic style is awesome, keep it up! type of clever work and reporting! Keep up the good works guys I've added you guys to my personal blogroll. a taboo subject but generally people don't talk about such topics. To the next! Many thanks!! I'm hoping to offer one thing again and aid others like you aided me. here? I'd really love to be a part of online community where I can get feed-back from other experienced people that share the same interest. If you have any suggestions, please let me know. Many thanks! i came to “return the favor”.I'm attempting to find things to improve my site!I suppose its ok to use a few of your ideas!! your augment or even I achievement you get entry to consistently fast. of the responses on this page "Nikola Tesla- as Close as it Gets!". I actually do have 2 questions for you if it's okay. Could it be just me or do a few of the remarks look like they are written by brain dead folks? :-P And, if you are posting on additional online social sites, I would like to follow you. Would you make a list of all of all your social networking sites like your linkedin profile, Facebook page or twitter feed? Hello there, simply become aware of your weblog through Google, and found that it is truly informative. I'm going to be careful for brussels. I'll appreciate for those who proceed this in future. A lot of folks will be benefited out of your writing. Cheers! tweeks would really make my blog stand out. Please let me know where you got your design. I visited multiple blogs but the audio feature for audio songs current at this web site is in fact fabulous. this topic. You understand so much its almost hard to argue with you (not that I actually will need to…HaHa). make sure to don?t disregard this website and provides it a glance regularly. certainly like what you're saying and the way in which you say it. You make it enjoyable and you still take care of to keep it sensible. I cant wait to read far more from you. This is actually a tremendous site. else could I get that kind of information written in such a perfect method? it looks fine however, when opening in I.E., it's got some overlapping issues. I just wanted to give you a quick heads up! Besides that, excellent blog! on your blog, I really appreciate your way of writing a blog. am getting experience everyday by reading thes fastidious content. I drop a leave a response whenever I especially enjoy a post on a website or if I have something to contribute to the discussion. It is triggered by the passion displayed in the article I browsed. And on this post "Nikola Tesla- as Close as it Gets!". 2 questions for you if it's okay. Is it only me or does it give the impression like some of the comments appear like written by brain dead visitors? :-P And, if you are posting at other sites, I would like to keep up with anything fresh you have to post. Would you list the complete urls of your shared sites like your twitter feed, Facebook page or linkedin profile? I'm going to take a note of your blog and keep checking for new details about once per week. I subscribed to your RSS feed as well. it for him... lol. So allow me to reword this.... Thank YOU for the meal! my diary every day. I'd like to start a blog so I will be able to share my own experience and thoughts online. Please let me know if you have any suggestions or tips for brand new aspiring bloggers. Thankyou! Hey very cool web site!! Guy .. Excellent .. Amazing .
. I will bookmark your blog and take the feeds also? I'm satisfied to search out a lot of useful info here in the post, we need work out more strategies on this regard, thanks for sharing. . . . . .
the topic of this web site and at the moment this time I am visiting this web site and reading very informative posts at this time. Fantastic beat ! I wish to apprentice while you amend your website, how could i subscribe for a weblog web site? Remarkable issues here. I'm very satisfied to look your article. Thank you a lot and I'm taking a look forward to contact you. It's lovely worth enough for me. In my opinion, if all web owners and bloggers made just right content as you did, the net will likely be a lot more useful than ever before. I'm simply now operating on, and I've been on the glance out for such information. Hi there, this weekend is fastidious for me, since this moment i am reading this fantastic informative article here at my house. blog! I had a quick queѕtion ωhich Ӏ'd like to ask if you don't mind. yοu center yourself and clear yоur thοughts before wrіting. trying to figure out hoω to begіn. Any ideaѕ or tіps? It's going to be finish of mine day, however before end I am reading this great article to improve my knowledge. using? I'm having some small security issues with my latest website and I'd like to find something more safeguarded. I'd really like to be a part of online community where I can get suggestions from other experienced people that share the same interest. If you have any recommendations, please let me know. Cheers! individually suggest to my friends. I'm confident they will be benefited from this web site. A lot of times it's challenging to get that "perfect balance" between user friendliness and visual appearance. I must say you have done a excellent job with this. In addition, the blog loads very fast for me on Chrome. Outstanding Blog! An intriguing diѕсussiοn is ωorth comment. theѕe ѕubjeсts. To the next! My bгother suggested I might like thіѕ blog. This рost аctually maԁe my dаy. time I hаԁ spent for this іnformаtion! but thiѕ artiсle iѕ actually а pleasаnt piecе of wгiting, keep іt uρ. over agaіn. Αnyhoω, juѕt wanted tо say fаntastic blog! bіt, but other than that, this is great blog. A great rеaԁ. I will cегtainly be back. a large amount of work? I've no knowledge of computer programming however I had been hoping to start my own blog in the near future. Anyways, should you have any ideas or techniques for new blog owners please share. I understand this is off topic nevertheless I just had to ask. Thanks! Hi there it's me, I am also visiting this web site on a regular basis, this web site is really good and the visitors are actually sharing good thoughts. was wanting to κnoω if blogѕ usе WYSIWYG eԁitors or if уou haѵe tο manually coԁe wіth HΤМL. I'll immediately grasp your rss as I can not to find your email subscription link or newsletter service. Do you have any? Please permit me realize in order that I could subscribe. Thanks. Hi it's me, I am also visiting this site on a regular basis, this website is actually pleasant and the visitors are in fact sharing pleasant thoughts. A person necessarily assist to make significantly articles I'd state. This is the very first time I frequented your web page and to this point? I amazed with the research you made to create this particular post amazing. Magnificent process! Pretty nice post. I just stumbled upon your blog and wanted to say that I've really enjoyed browsing your blog posts. In any case I will be subscribing to your rss feed and I hope you write again soon! net, except I know I am getting knowledge every day by reading thes fastidious content. Genuinely no matter if someone doesn't be aware of then its up to other viewers that they will help, so here it happens. what I needed. I most surely will make certain to don? I wouldn't mind producing a post or elaborating on a number of the subjects you write about here. Again, awesome blog! The clarity for your put up is simply great and i could suppose you're an expert in this subject. Fine along with your permission allow me to grab your feed to stay up to date with imminent post. Thank you one million and please carry on the gratifying work. Anyhow, I'm definitely happy I discovered it and I'll be bookmarking it and checking back frequently! you have acquired here, really like what you're saying and the way in which you say it. You make it entertaining and you still take care of to keep it smart. I can not wait to read much more from you. This is really a terrific site. It kind of feels that you are doing any distinсtive tгіck. Moгeονeг, The contents are masterpіece. yοu've done a magnificent task in this topic! nice to read this webpage, and I used to visit this webpage every day. Hi, everything is going fine here and ofcourse every one is sharing information, that's in fact excellent, keep up writing. Thanks for your personal marvelous posting! I genuinely enjoyed reading it, you're a great author.I will make sure to bookmark your blog and will eventually come back from now on. I want to encourage you to continue your great writing, have a nice morning! it ;) I am going to revisit once again since i have book-marked it. Magnificent goods from you, man. I've understand your stuff previous to and you are just extremely excellent. I actually like what you have acquired here, certainly like what you are saying and the way in which you say it. You make it enjoyable and you still take care of to keep it smart. I cant wait to read far more from you. This is really a wonderful web site. Fairly certain he's going to have a great read. Thank you for sharing! Nice answer back in return of this matter with genuine arguments and describing all concerning that. Nonetheless, the posts are too short for starters. May just you please prolong them a bit from next time? and without a doubt, you've hit the nail on the head. The problem is something which not enough folks are speaking intelligently about. I am very happy that I came across this during my search for something concerning this. Asking questions are truly fastidious thing if you are not understanding something totally, but this piece of writing provides nice understanding yet. I've been browsing on-line greater than 3 hours today, but I never found any fascinating article like yours. It is lovely value enough for me. In my view, if all web owners and bloggers made good content material as you probably did, the web will likely be a lot more helpful than ever before. I know this web page provides quality dependent posts and extra information, is there any other website which gives these kinds of stuff in quality? What's up, I would like to subscribe for this web site to take newest updates, therefore where can i do it please assist. This blog was... how do you say it? Relevant!! Finally I've found something that helped me. Appreciate it! I rarely write remarks, however i did a few searching and wound up here "Nikola Tesla- as Close as it Gets!". And I do have some questions for you if it's allright. Is it simply me or does it look like some of these comments come across like coming from brain dead folks? :-P And, if you are writing on additional online social sites, I would like to keep up with anything new you have to post. Would you list of the complete urls of all your communal sites like your Facebook page, twitter feed, or linkedin profile? May I simply say what a comfort to find somebody that really knows what they're discussing on the web. You definitely understand how to bring a problem to light and make it important. More people need to read this and understand this side of your story. I was surprised you are not more popular since you most certainly possess the gift. for revisiting. I wonder how a lot attempt you place to create this sort of excellent informative website. Hi to every one, as I am actually eager of reading this webpage's post to be updated daily. It carries nice stuff. Hey very nice website!! Guy .. Excellent .. Wonderful .
. I'll bookmark your website and take the feeds also? I am glad to seek out a lot of useful info right here within the put up, we want develop more strategies on this regard, thank you for sharing. . . . . .